This full day tour is so rich in content that you definitely do not want to miss it! You will be brought to several popular sightseeing spots in Japan, including Mt. Fuji 5th Station, Kawaguchi Lakeside, Mt. Kachi Kachi Ropeway and Oishi Park for flower watching! Enjoy lunch at the Kawaguchi Lakeside restaurant with Yamanashi Prefecture's popular "Houtou Udon Noodles" meal set. 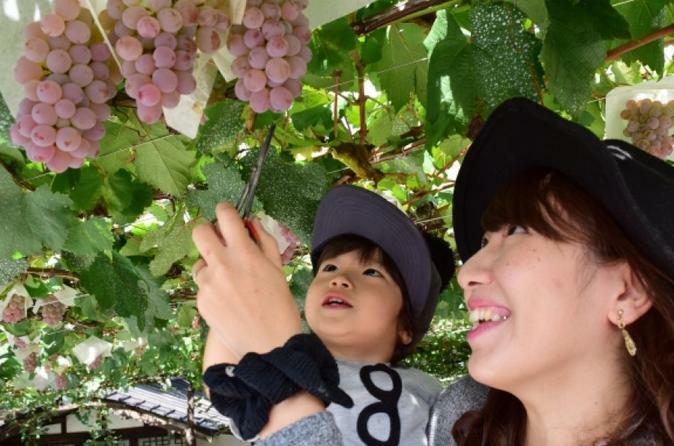 At the end of the tour, you'll be lead to the Yamanashi Prefecture Sightseeing Orchard for seasonal fruit hunting! Join in on this rich and wonderful, small group tour (maximum 15 travelers). This tour departs from Shinjuku at around 8 am. Traveling for about two and a half hours by the tour bus and passing through the Fuji Subaru Line, you will reach the first destination Mt. Fuji 5th Station for sightseeing. It is the most popular station among foreign travelers due to its beautiful scenery and good atmosphere! Even if you are not a mountain climber, you can still be there in person and experience the fresh air and nice view! And most of all, remember to take some great photos for memories of your trip! Continuing with the tour, the next destination is the Kawaguchi Lakeside, where the restaurant for lunch is located. Enjoy your traditional Japanese style "Houtou Udon Noodles" meal and take a break here for about 60 mins. Then you will have energy and get ready for the next destination! Ride on the Mt. Kachi Kachi Ropeway for about 3 mins and reach the peak! From here you can enjoy a 360-degree panorama at an altitude of 1,075 meters high! After that we will lead you to Oishi Park for sightseeing and flower watching. It is also a great spot to watch Mt. Fuji. In 350 meters long pave-way inside the park, you can watch more than 90 type of flowers. Spring, Summer, Autumn and Winter with different seasonal flowers. Such as Shibazakura, rapeseed, tulips for May; German calamus, lupine for June; Lavender (Herbs) for late June to mid-July; Begonia and cosmos for July to September; Kochia for October and Autumn leaves for November. You can enjoy lots of floral colors at different times! Then it comes to the highlight of the day - seasonal fruit picking! Pick and eat the seasonal fruits in the orchard. Fruits will depend on seasons - strawberry picking from March until May 16th, cherry picking from June 1th until June 17thi, Peaches served (on the plate) + picking 2 peaches as a souvenir from June 20th until August 5th. and grapes from August 6th. After Fruit picking, the tour bus will return to Shinjuku and arrive at around 6pm when the day tour concludes.